listening to the directives of an inner voice. While everyone around him was dancing to the beat of an establishment sound, John turned up the volume on that different drum. The power of John's witness -- both his own personality and the truth of the message he preached -- was so great that people left the well-worn city streets and village squares to seek him out. Pulled along by the flow of John's spiritual forces, these crowds goatwalked their way to this solitary voice in the wilderness, not knowing what to expect, yet filled with an inexplicable hope and anticipation. Goatwalking has always been a favorite way of encountering the God of the Scriptures. 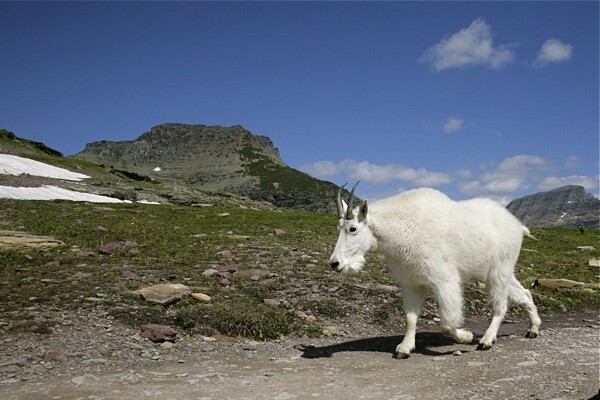 The Hebrews spent 40 years goatwalking, or perhaps "goat-bumbling," as they tried to discover the path that would lead them into a faithful relationship with God. God has regularly chosen goatwalkers to be divine mouthpieces. Some of the oddest, most independent and unpredictable people are found among the prophets. It should come as no surprise to us then that it was to "professional" goatwalkers -- the goatherds and shepherds camped out with their wandering flocks in the middle of nowhere -- that the announcement of Jesus' birth was first proclaimed. The first people on the scene in Bethlehem, to worship and praise the tiny newborn king, were these simple, scruffy social zeros -- the goatwalkers. As Christmas fast approaches, we may all be helped by consciously taking some time to slow our steps and broaden our horizons to try to see if we too can goatwalk into Bethlehem this year. So throw away your compass, your cellular phone, your belt- beeper. Give up those Stations of the Crass. Pull on your camel- hair coat, grab a baggie full of locusts and goatwalk your way to Bethlehem. You can set out on any path you choose. For whether you reach it or not depends on your sense of everything but direction.